The initial conversion of 126 screens in three shopping malls has been completed. A McDonald's ad on this Core Out of Home display drives shoppers to the food court. 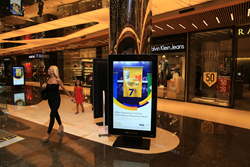 BroadSign International, LLC, the largest provider of automated digital out-of-home software, has been selected to power the Core Out of Home network, formerly known as Clear Channel Turkey. The initial conversion of 126 screens in three Turkish shopping malls has been completed and rollout will continue across over 1,000 displays and ten shopping malls in total. Inventory consists of 55” – 65” portrait oriented LCD displays, as well as 1x3, 3x4 and 4x3 videowalls. “Upon meeting BroadSign this year at Integrated Systems Europe, we quickly decided to convert to the industry-leading platform due to its simple and flexible design,” said Demirhan Cavusoglu, Head of IT at Core Out of Home. To learn more about BroadSign’s DOOH platform, sign up for a Free Trial.